Yesterday we had a meeting at Ansari Road, Daryaganj for ShikshaDaan. Initially we thought we will use the metro and then take an auto from the Chandni Chowk station, but at 2 pm the heat was unbearable and I chickened out. We took an Uber and reached our meeting venue almost 45 minutes ahead of schedule, but that was much better than using the metro and sweating our way through. While we were in the Uber cab, we realised that we were just 400 metres from Abhaya’s office, so we called him up and I shamelessly asked him to get something nice to eat. We completed our meeting and walked across to Abhaya’s office. He had brought in peas samosa, dhokla and jalebi – all three were mouth watering and oh so awesome!! I immediately wanted to get some peas samosa to take home for Amma, but apparently the guy who makes those samosas was long gone by then. So I said, let me get Jalebis then – and Abhaya being Abhaya insisted on getting us two packs of 250 gms… how can I say no to really good jalebis ? So off went his office help to get some more jalebis for us to carry back home while we chatted about ShikshaDaan and our favourite topic – politics. Suddenly I realised that it was nearly 6.30 and the person who had gone to get the jalebis had not returned yet…. and I had told Mom that we will be back before 8.30. Before we could get worried, the person returned with two packs of jalebis :). So Krishnan immediately started to look for Uber cabs and found one that was 18 minutes away. When we called the Uber driver, he told us he was 40 minutes away and the map was wrong !. We canceled that one and tried another cab but none were available nearby. All the cabs were atleast 25 minutes away. Then we tried Ola cabs and those were also 25 minutes away. Finally we told Abhaya, that we will take an auto rickshaw and reach either the Rajiv Chowk metro station or New Delhi Railway Station and try for an Uber there. We came across the road and suddenly found none of the regular autos were available ! This was around 7.15 or so… finally we saw an empty e-rickshaw (battery operated) and he agreed to drop us off at New Delhi Railway Station. We got in and one more young man got in as well. 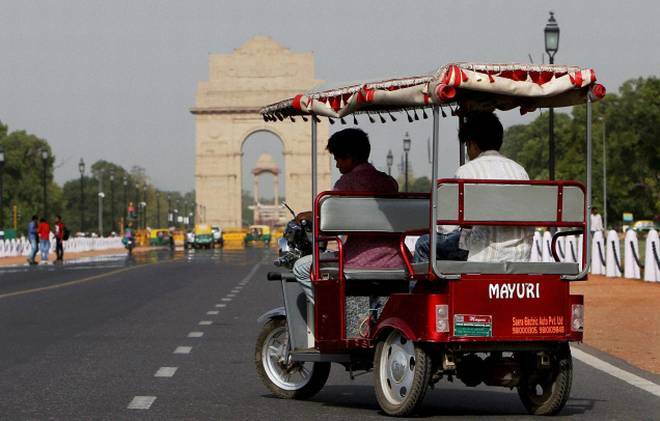 It was our first ride in an e-rickshaw and it was quite good. Just as we were nearing the New Delhi station, our driver started playing really loud music where neither could he hear other vehicles that were coming dangerously close to him nor were we able to speak to each other. Finally he switched it off after I asked him to. He dropped us off at the entrance of the New Delhi railway station, and right at the entrance is the entry to the metro station. By this time, I was ready to go home in the metro!! We got into a really crowded train around 7.40 pm and luckily I managed to get a seat to sit. This train was only till Sultanpur, so we got off at the Chhattarpur station (one before) and took the next train and reached IFFCO chowk station by 8.45. Got home in an auto by 9 pm with the jalebis intact and we also didn’t contribute to the pollution and traffic snarls by taking a cab. I was just wondering that if the same thing had happened before 2009 when the Gurgaon metro line was inaugurated, we would have been in a bind to reach back home and it would have taken us much longer getting back. The Delhi Metro is indeed the lifeline of Delhi and guess what, the station and the trains were clean inspite of the thousands that were travelling at peak hours. There was some garbage at the entrance, used coffee cups, bottles, some paper napkins etc but mostly the place was clean. We did eat some jalebis at home and Amma ate just one :). We have eaten some more today and shared it with a guest… will polish it off tomorrow. We were certainly exhausted by the time we hit the bed and I nearly missed informing my yoga teacher that I couldn’t do the class today morning – I woke up at 5.55 just 5 minutes before my class but luckily he was just closing his earlier class so I managed to reschedule. Good jalebis are not easy to find and its ok to eat them and enjoy them when you find good ones. Thanks to Abhaya for the awesome jalebis and all the chit chat …. brought back memories of the Patparganj days. I used the metro a few times when I was there about a year ago. I was extremely impressed. Like you say – very clean despite the huge number of users. As a tourist, I could wait until after rush hour so I always got a seat. And despite our subway having been around since the 1950’s, yours is almost 5x larger.